1. What's simple, classic, and not allowed to be worn with baggy pants? Check out this 100% synthetic Chelsea Boot from TOPMAN. Hot, and only $100! Next, if your metal-head babysitter from 1985's wardrobe got turned into an amazing, urban, hi-top - these gold 'n black faux-snakeskin foot-prizes would be it. Dang! Only $70 at TOPMAN. 2. Dr Cow Cashew-Bazil Nut & Macadamia vegan cheeses now available online! They are not cheap, but they are insanely yummy. 3. Speaking of cheese - I got to try the very-talked-about, soy-free, melty-as-hell Daiya cheese while mingling at a star-studded PCRM event last week. Yum! Not sure when it'll hit stores, but it was stretchy and delicious when heated. 4. Has anyone tried the So Delicious Coconut Milk Beverage? I saw it on the shelves in Whole Foods, but I haven't tried it yet and want to know: how does it taste? Can you steam it or foam it? Does it curdle in tea? Tell me! 5. Once again, the Canadian Seal Hunt is leaving a trail of blood. Please watch the video and click HERE to help. 6. 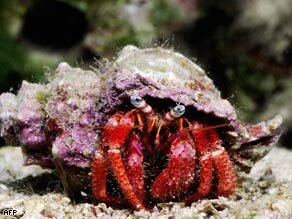 A new study has found that crabs feel and remember pain. So that's what a brain and nervous system do? It seems silly to even have to point this out, but unless scientists shock living things, the public thinks that brains and nervous systems are just for fun. As if you neeed one more reason to boycott Red Lobster? Duh, what's trawling?